These infused balsamic vinegars are great on salads or can be used as a marinade for meat, chicken or fish. The lime and ginger infusion is a lovely option. Also available in Orange Blossom and Strawberry variants. 12 bottles x 250 mL Infused Balsamic Vinegars. Crafted in Tasmania, these all-natural, Balsamic Vinegars are beautiful as marinades, cooking aides and salad dressings. The vinegars are versatile, exotic and simple to use on all your favourite dishes that require vinegar. All products contain minimal or no fat, but are infused with 100% natural flavours. 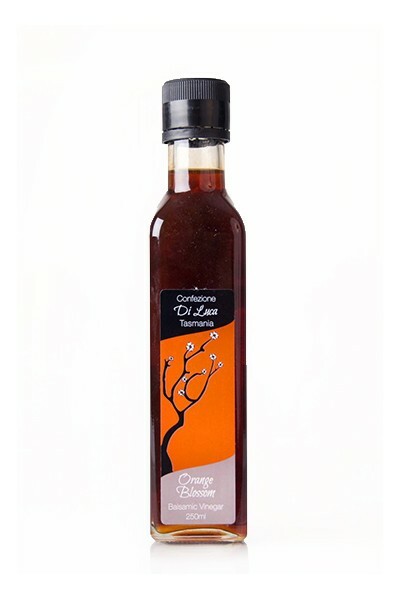 The vinegars are great on salads or can be used as a marinade for meat, chicken or fish. Some customers even love the vinegar as a tea! The lime and ginger infusion is a lovely option. Each variety is also beautiful as a salad dressing. BUY at wholesale prices and save! Available in mixed or single variety cartons of 6 or 12 bottles. $12.00 per bottle ($144.00 per carton of 12 bottles) plus postage to anywhere in Australia (approx $30.00 incl gst).